We finished off the class today doing a drill from Chon-ji that we did a week or two ago - deflecting the oncoming lunge strike from opponent using the fold for the lower block (Hardan Marki) and then coming down hard on the forearm using the blocking motion. In theory, practicing the lower block in Goman (normal ready stance) the left blocking arm is folded to the upper right over the right ear. The folding motion also turns the body slightly to the right. The right arm is wrapped around the left ribs at about one fist away from the body. The focus of the drill was to ensure that this turning occurs whilst under duress. Not only does the turning of the body present a much smaller target, it allows some deflection of the punch if the oncoming trajectory has not been modified by your block (meaning your block sucked). So if the opponent were to lunge at me with his left arm, I would turn to the left and block his arm from the outside with my right forearm. Not only does the body rotate, in order to have solidarity in my body movement, I have to exhale. The exhalation allows me to think of creating a small convex in my body in order that I increase the distance between the striking arm and its target. With a pliable, relaxed, and responsive body I then perform Chon-ji's lower block by dropping my entire body weight like a pile driver on the extended striking arm. This is a method of creating a lot of power without lunging forward. It's related to the 'falling forward' most beginners would use when striking with the lead hand in a 'self defence' situation. However, rather than just dropping one leg, both legs in this case are synchronised and move apart at once. The drop needs to be transmitted into your blocking motion - so some coordination is appreciated. You cannot be tense and relaxed at the same time. 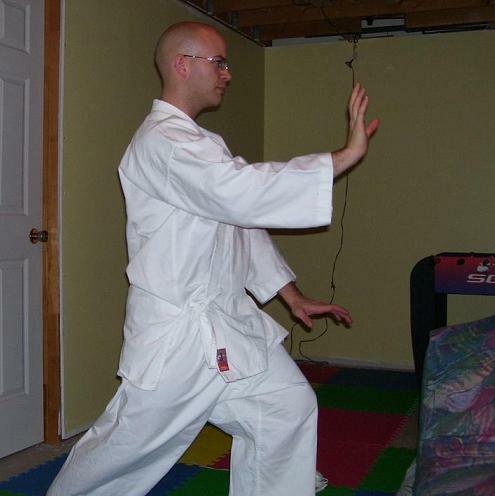 Many people have the overwhelming urge to make a hard style martial art more tense than it should be. There is a lot of rigidity within a hard style martial art, but within this basic framework -- relaxation between techniques is very important. A good training tip is to make sure you are attempting to learn moves whilst being as relaxed as possible. MokurenDojo: What is So Universal about Taikyoku? Ok, there are four posts. 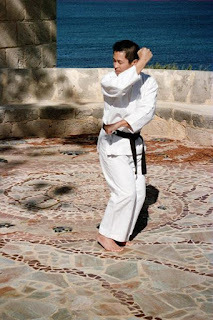 But all in all, the december archive of Goodin Sensei's blog is mostly regarding hanmi-body alignement. I thought it was an interesting read. Also, during my own personal training (very limited, mind you) I find that hanmi feels much more natural/less harmful to the body. I like the thought of the last paragraph. I found a lot of improvement in my spinning type kicks -- wheel kick, spin stomp kick, tornado and spin kook kick -- which don't come very naturally to me, by relaxing the action of lifting my leg. The post was not essentially about body alignment, though this is also a fairly big and important topic in itself. Whether or not with the tanden straight on the opponent or at an oblique angle when striking, the main stays of a forward lunge punch are dynamic acceleration with the legs, skeletal support for the punching arm, and instantaneous tension in order to transmit the force from the legs into the arms. This can occur with both the straight on and oblique body angle approaches. I have TKO'd an opoonent with the body straight on - which was not to my intention, but the technique drove the strike, and I couldn't stop it when it started. This is a good beginner's form as it helps the unitiated to get a really good strike off PLUS allow you to strike or block with either hand. Do it right and the opponent doesn't know what's coming. But yes, the body is slightly more exposed. In the Hanmi, there is more of a tendency to use more shoulder rotation but with the increased relaxedness, most people can drive the punch faster. What I like about this Hanmi position is that you can follow up with a quick succession of other strikes or a powerful ikken hisatsu (one punch one kill) type strike. I have used this technique before and like its effectiveness. My original post wasn't about the discussion of holding the body straight on or at an oblique angle. My discussion was about relaxedness in transition states. For instance when you're stepping forward, or when you're folding for the block. Charles Goodin pointed out that the graphic on top of his blog of Gusukuma Shinpan, a student of Anko Itosu looks like a hanmi - but do you see the platform he's on? He can't lunge forward so his gedan barai (lower block or hardan marki) done at an oblique angle allows him the chance to also strike with his back hand if needed. Such positions really are dependant on the opponent and circumstance - beginners are taught straight on because they are taught one or two ways to attack and one or two ways to counter. One of my instructors told me that all the basics teach parameters of movement. Therefore any movement within those parameters are also 'allowed' depednant on your circumstances. Once you start figuring things out faster and when you've got more tools to work with, then these become more appropriate for you to use. Good response! Thanks for the links. I found a lot of improvement in my spinning type kicks which don't come very naturally to me, by relaxing the action of lifting my leg. Many hard style moves require you to increase muscle tension dynamically - meaning the body becomes tighter as you get toward the target. However, for spinning type kicks, you have a quick increase of tension plus then a gradual increase of tension to maintain the speed acceleration. But yes, most of the time, relaxation is really good when you're learning a rather complex move. A mirror may help too. Ah Colin.. Just what the doctor ordered to help me with my dilemma. Thank you!